This article appears in print in the November 2018 issue. Click here to subscribe. Lovely and well curated, Blu Dot (Capitol Hill, 401 E Pine St.; 206.858.9309), a Minneapolis-based home furniture store, opened its first Seattle location on July 2. The 5,800-square-foot store, located in the old Colman Automotive Building, which formerly housed beloved mid-century modern furniture purveyor Area 51, is as stylish and modern as its signature furnishings. 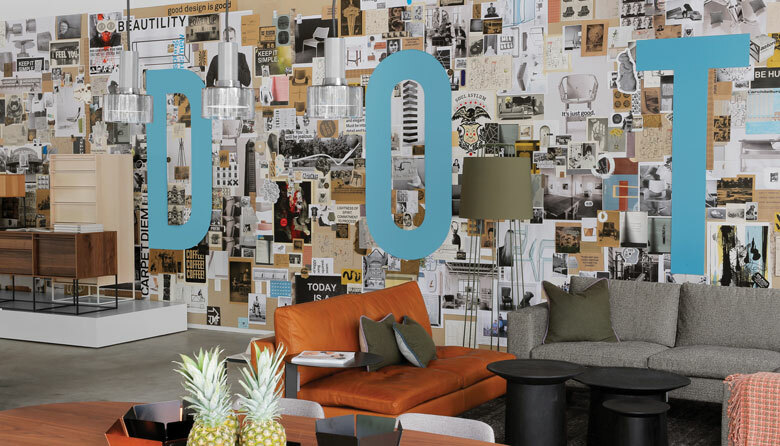 The store bears the hallmark of a 60-foot custom collage installation, designed by Blu Dot’s visual team for the Seattle location. With best-sellers like the boxy, low-slung Cleon lounge chair (from $1,299) and the futuristic Real Good chair (from $199), it’s evident that Blu Dot specializes in original, contemporary pieces meant to fit any budget. “Seattle’s down-to-earth yet wildly creative vibe really resonates with us,” says senior vice president Medora Danz. She says that although they’ve sold merchandise at local retailers in the past, including Area 51, they’re excited to introduce new people to the brand. “Plus, we love a good cup of coffee.” Welcome to the ’hood.